You can follow the discussion on Pitti celebrities by entering your email address in the box below. You will then receive an email every time a new comment is added. These will also contain a link to a page where you can stop the alerts, and remove all of your related data from the site. I thought that was you! 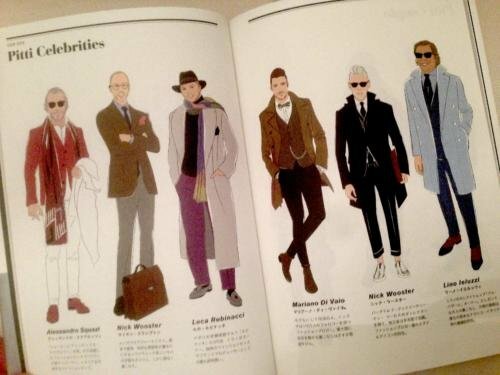 That’s a great illustration, capturing each man’s individual flair and style. Amazing coincidence there could be two Nick Woosters… even greater coincidence that one looks like Simon Crompton! Bit out of focus, but it looks like it says “Simon..”, definitely not “Nick Wooster”. Nice illustration! And great blog, quite generally (long-time reader, first-time commenter). The Japanese text also correctly identifies Tom Baker as Dr. Who to your left. Interesting that the “Italian dandy” is in double breasted. As far as I can see, your name spelled correctly in Japanese. It looks like a great book, but it is a shame to find a mistake like that! Attention to detail, I would say. Simon, whilst we must all celebrate the general resurgence of interest in men’s formal dress, I can’t help feeling that so many at Pitti miss the whole point of real style. A man should dress well whilst doing what he’s good at. The clothes, no matter how nice, should always be secondary. Cary Grant, Gianni Agnelli, Gary Cooper, Fred Astaire – they were eminent in their lines of work – and looked all the more stylish because of their talent and charisma. Their work was their focus and the reason for their names being known. They also happened to dress very well. The male peacocks, that one observes at Pitti and elsewhere, see dressing well as a goal or even a ‘career’ in itself. They dress only to impress others or to out-do each other. I find it rather pathetic. Some style journos seem to spend more time posting photos of themselves on social media than they do writing about their subject! Self-obsession is unattractive and compliments should never come from oneself. Any clown can dress and accessorise up to the nines. It’s easy! Most of those dandy-ish silk jacquard evening jackets that are everywhere will be deeply unfashionable soon enough. They are a fashion fad and it’s disappointing to see some august menswear names endorsing such transient Austin Powers-esque garments. Real style and sophistication has always been about observing the subtle details and conveying confidence through understatement. Such notions seem lost on so many. It’s great to see the fashion pack coming round to our way of thinking at last. Let’s hope they learn a few things before they run off to jump on the next trend bandwagon! Tragically, I recognised 4 of the six immediately. You and Mariano di Vaio on the same page is an offense to good taste–and I mean it out of respect for you! The bandwagon that Mac refers to always moves on and I understand his points re. the difference between fashion and style. However I welcome the change like a fresh breeze. Style should always reflect a contemporary nuance otherwise it can, over time, move to stuffy costume. The danger is in adopting the avant garde before it has had time to soften its edge through use, if adpoted too early it also lives in the realm of costume. The beauty of each change is that it embraces different body shapes and characters at each turn of the wheel. The current vogue for very slim cuts began with Hedi Slimane in 2000/1. Great for the tall and slim or for the young and lean, but for different body shapes the latest from Milan is a welcome change (fuller cut trousers, loose jackets, layered ensembles). The times have also changed, the brash confidence of a decade ago has altered over time through economic downturn and a multitude of conflicts, we are no longer in the mood for what was or is and seek change, and fashion therefore reflects this. We identify fashion with particular feelings of time, place and emotion but we as human beings constantly seek to move forward. Were fashion never to change nor adpot the new the lifeblood of style would therefore cease to flow. Icons of style such as Grant and Cooper followed this rule, which is why the Kilgour suit in North by Northwest, sported by Grant, broke new ground but remains timeless. Hi Stephen, I was referring to the ephemeral and the fleeting. Isn’t that what Top Shop does? I’m simply alluding to style that is indeed ‘permanent’. It has little connection with fashion. Men are different to women. Design for design’s sake always looks superfluous. On a woman, it can be interesting certainly. A trend-driven man, in my book, is not a man to take seriously. He is a man who changes his mind every few weeks about who he is and what his style is. He wears not what suits him, but what others are wearing. We’ll have to agree to disagree! Simon, luckily for you, you look nothing like a 50 year old hipster. Very true. You’re the only one who looks like a normal person and not a fashion victim.